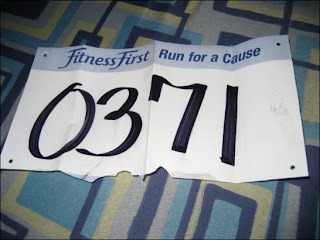 Last 16th of September, I joined the Fun Run of Fitness First. It was held in Fitness First The Fort branch. 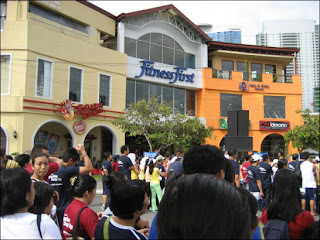 There were many people there, personal trainors and gym members of 15 Fitness First branches. My personal trainor Joel asked me to join and since it will be my first time joining a marathon, I said yes. I arrived on the site at around 6 in the morning and I headed the line giving out the numbers. My number was 0371. I joined the 7.5k marathon and whew! Sobrang nakakapagod tumakbo around the Fort and we even reached a military camp. The Fun Run started around past 7 and when the signal to run was heard, everyone was enjoying the run. The others were seem to be very agressive to win but for me, it was just for fun so I just run and enjoyed the moment. I guess on the first 2 or 3k, my personal trainor was beside me but he was so slow... hehehe... So nauna na ako sa kanya and made my finish spot. Joel finished the 15k run because it was required to all Fitness First employees. After my run, grabe, inatake ako ng allergy!!! Putek, napuno ng pantal ang katawan ko. So after a quick shower, I went to the standby emergency vehicle and they treated me. The nurse said that it was maybe because of the heat of the sun. The emergency vehicle was air conditioned and unti unti ay nawala na yung pantal. After such treatment, the overall head of Fitness First Philippines made a closing remarks and gave away the prizes for all the winners.